As much as I love Café An-An (find my original review here), it’s difficult for me to get there as they are usually open only on weekdays. This year though, they have been opening more on some weekends and doing special okonomiyaki days, which I was really keen to go to as I have never tried this Japanese pancake. 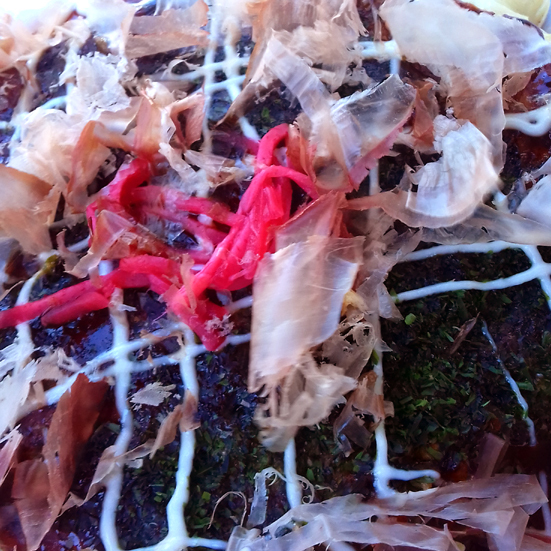 My sister, who also loves Japanese food, has raved about okonomiyaki for a while now. Tim chose noodles and then wished he ordered the same as me- ha! There was a choice of meats and seafood and I opted for my usual ‘safe’ choice of chicken. 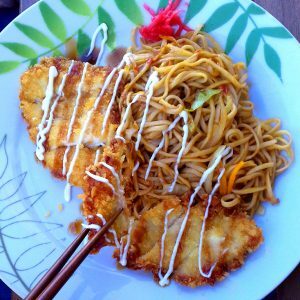 Tim, who didn’t like the sound of a pancake for lunch, opted for spicy chicken yaki soba. I did smile to see his slightly envious face at my okonomiyaki when it came out. He was also won over by it when he tried it. I think he was imagining a filled crepe which is not what okonomiyaki is like at all. The toppings are the same as those put on takoyaki: aonori (seaweed flakes), bonito flakes, Japanese mayonaise and okonomiyaki sauce, which is thick and sweet but tangy. It was also topped with red ginger (which I love) and toban jian chilli paste, which I forgot was served as a condiment the last time I visited Café An-An. I really must start using this more for dipping instead of just for cooking as it works so well for umami spiciness with delicate Japanese flavours. Closeup of the okonomiyaki toppings- yum! 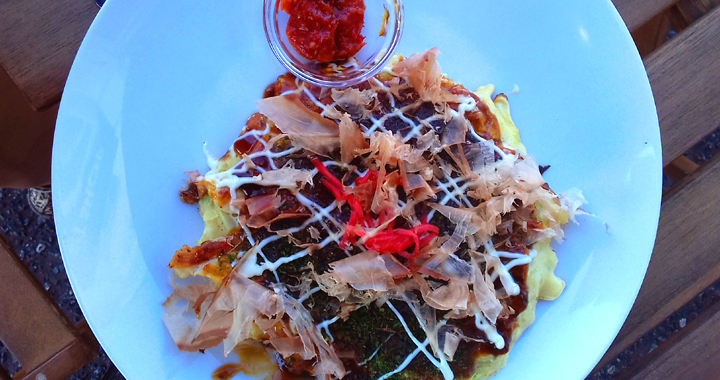 The okonomiyaki did not disappoint. Although it’s called a pancake, to me it’s more like an omelette, cooked with egg, cabbage and meats. It is funny how such a simple combination of ingredients and flavours can come together to make such a tasty meal. Service was a little slow, but I can forgive the lovely lady at the café as she seemed to be working alone and had quite a lot of people turn up to try the okonomiyaki. Not surprising given how good the food is! We will definitely return in the future for another okonomiyaki day and for more wagashi, which are also amazing from here. If you are in the Brighton and Hove area around one of Café An-An’s okonomiyaki days (follow their Facebook page for updates), I highly recommend going to try this classic Japanese dish. Next on my list is to learn how to make okonomiyaki myself, so maybe soon there will be a blog post with my own recipe so you can make your own! Posted in Restaurant Reviews, Uncategorised and tagged Japanese cafe, okonomiyaki, Review.